In April 2018 the Syrian government modified and extended an earlier Damascus-only urban reconstruction decree (Decree 66), to now be applied nationwide in Syria. This new law (Law 10) allows the Syrian government to award contracts for reconstruction to national and international investors, and to compensate citizens in the form of shares in regulatory zones. The earlier Decree 66 demonstrated the politicization of urban renewal policies. 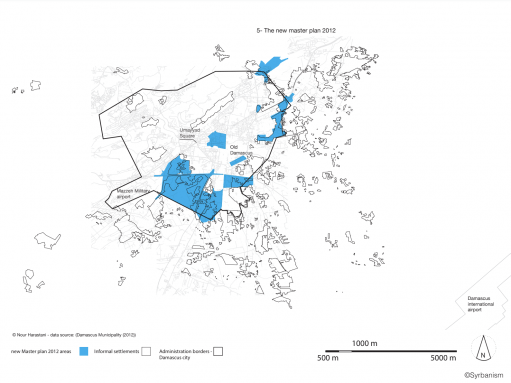 It had named two informal zones in southwest Damascus to be reconstructed following the new 2012 master plan of the city; it also increased the percentage of informal settlements on the list to be demolished from 40% to 60%. However, these were not areas that were devastated by conflict, the conflict was in the redevelopment. Unlike most Syrian cities, Damascus, has not been under urban destruction due to the ongoing armed conflict. Yet, it has experienced different manifestations of urban contestation. This contestation has been clearly manifested by the so called ‘post-conflict reconstruction’ which has started – despite its name – during the conflict in 2012 and caused exclusion and eviction to many residents. The history of Degree 66 is highly pertinent to the present context of Law 10, as it is the same strategy being manifest, but now on an even larger and more detrimental scale. In 2018 the Syrian government proposes through Law 10 to do what was done in the one Damascus zone five years earlier on a national scale; removing people from their homes, inadequately compensating people, disposing of property rights, advancing the agenda of external ‘developers’ and in many other ways leveraging urban reconstruction as another weapon of conflict. What happened before and what does this tell us about what is going to happen now? Government positioning of such reconstruction as progress: The government worked tirelessly on circulating decree 66 through media channels, radio, and the national newsletter as the pilot project towards modern post-conflict Syria. As the Damascus Governor noted at the time “Three main principles have been fundamentally taken into account in this project. 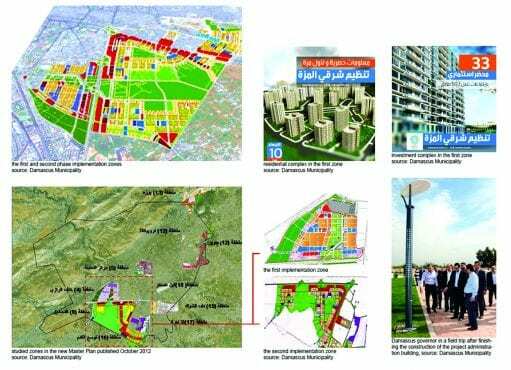 These are; Social Justice; The high performance of implementation; and financial returns for Damascus governorate which allow sustaining services provision and initiating new projects”. The areas for redevelopment were largely areas of opposition to the government, hence reconstruction and removal of people can be seen as politicized: The decision of implementation took place only in the first Zone that hosted frequent demonstrations between 2012 and 2013. Moreover, this zone is very close to the most international organizations, embassies, ministries, and one of the presidential palaces. This gives the quarter a strategic standing in Damascus. Many informal residents did not receive equitable compensation and rehousing: The Decree 66 has dealt with the entire zone as a collective ownership among its residents and despite the many different types of property’s ownership and the specific context of informal unites, people got rehousing in the yet to be built compensation units based on their shares. Therefore, many informal residents who used to live in small informal houses were not able to get the smallest apartment in the compensation units due to the variation of scale. Many residents were driven from their homes: Some residents had their properties seized due to their political stance they had, and others due to lack of equitable shares. As part of the whole ‘reconstruction’ implementation many residents were forcibly evicted from their homes with their possessions. Sometimes not even with this dignity. As one soldier expresses during one of the demolitions, “They were among the lucky ones. Not everyone is being allowed in to take their possessions”. In April 2018, while the Degree 66 project is still under construction, the Syrian government modified the Decree 66 to be applied nationwide in Syria, whether formal or informal areas and issued Law 10. So now citizens – whether in the country or outside the country – are faced with a situation of not knowing what is the basis of their property rights. 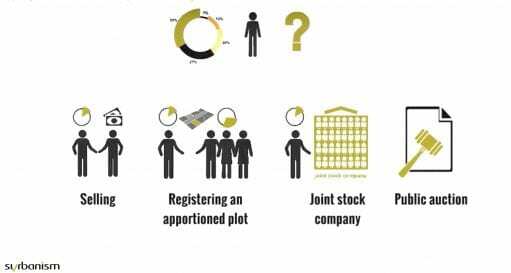 There is an enormous amount of confusion and significant potential problems; these include the challenge of lack of property documentation, lack of access for registration of ownership and many other challenges that do not even begin to touch on the political scenarios. Problem II – the danger to heritage and culture: Law 10 neglects all the social and cultural aspects that are integral to the Syrian cities by stating the targeted area of reconstruction depends only on the economic turnovers of the projects in this area. It might turn Syrian cities into new Solidere, the Beirut downtown project that ended up empty of people during the daytime because people don’t feel it belongs to their city. Problems III – lack of capacity on Local Administration levels: on a very practical level the new Law places a significant administrative burden on local government at a time of continuing crisis, and there is a strong concern that this will make it even more of a crisis. The Law says citizens are to be compensated in the form of shares in regulatory zones – but only where such regulatory zones are defined following a feasibility study of the area provided by the local administration unit and approved by the Ministry of Local Administration. This law centralises all decisions in the hand of local administration units, which don’t have the capacities, experiences or resources for these large-scale projects. Bearing all this in mind and learning from the recent past in Syrian urban politics it is clear that Law 10 simply cannot be ignored as just an internal Syrian minor urban issue. It is an international issue. Thus, international organisations, government officials in the EU and elsewhere, Syrian lawyers and urbanists amongst others, have recently expressed their concerns against this legislation and successfully managed to get the issue onto the U.N. Security Council’s agenda to follow up. As part of this movement ‘Syrbanism’ – which is a Syrian-led platform focuses on investigating the political, social and economic aspects of the urban discourses in Syria – has initiated an awareness-raising campaign about the Law. “Syrbanism aims at simplifying the technical language of urban policies to become understandable for all non-expert citizens”, notes Nour Harastani, Syrbanism co-Founder, “It starts by raising awareness in order to mobilise knowledge-based actions’’. The organisation has created two short informational videos, one in English and one in Arabic, to clearly and simply present the facts about the Law 10 process. The videos explain in detail the procedures and options citizens need to know about their property rights. The videos can be accessed via Youtube and the Syrbanism site. They are designed to provide information and as such are for use by all Syrians; so that everyone understands the situation and therefore can advance better solutions. The videos have been shared not only by refugees and opponents, but also by supporters to the government – because they are about potentially unworkable and damaging legal processes that are not just untenable on many local levels but also detrimental to most ordinary people. It is hoped that by all parties understanding the negative impacts of this law, that it can be reconsidered. Syrbanism aims to continue its awareness-raising work now in the next steps to reach out to more Syria-related organisations to bolder mobilisation and impact on advocacy within the EU to make an effective pressure on the Syrian government. Syrbanism believes that any reconstruction agenda, besides being negotiable and accountable, should consider the rebuilding ‘lives’ other that just ‘houses’. Otherwise, the Syrian conflict would definitely be shifted to another, more complex and longer-term one. Edwar Hanna is a recent graduate of the MSc In Building and Urban Design in Development. Trained as architect, he now works in international development and is co-Founder of the Syrbanism initiative. The international field trip is an integral part of the MSc Development Administration and Planning Programme (DAP) and this year, the students travelled to Kampala, Uganda for their field trip. This is the second year running that the MSc DAP programme has been working with development partners in Kampala, Uganda. This year, the MSc DAP programme partnered with eight NGOs and CBOs which included; Community Integrated Development Initiatives (CIDI), ACTogether, Community Development Resource Network (CDRN), Children’s Rights and Lobby Mission (CALM Africa), Living Earth, Uganda, Kasubi Parish local Community Development Initiative (KALOCODE), Action for Community Development – Uganda (ACODEV- U). The 8th partner, Shelter and Settlement Alternatives (SSA), gave a site visit in which they showed the students one of their current projects – The Decent Living Project. The city of Kampala is experiencing rapid urbanisation. A city, which was originally built on seven hills, has now expanded to that on more than twenty hills, with informal settlements sprawling up in different parts of the city. Infrastructure in the city has not expanded on par with the rapid urbanisation and access to amenities is a challenge for the millions that inhabit or the thousands that troop into the city for employment. The city of Kampala is also going through massive regeneration and this is visualised through the many construction works going on in the city. As developers and inhabitants contest for the urban space, those who cannot afford to live in the city are forced to move to peri-urban areas and some are even forcefully evicted. However, some of the community members are establishing cooperatives and also working with non-governmental organisations to have access to land. The central theme for this years’ field trip was examining how a development intervention is planned and implemented in Kampala, and the MSc students worked with their partners in understanding how Non-governmental organisations (NGOs) and community-based organisations (CBOs) in Kampala, Uganda, approach the planning and implementation of ‘development’. One of the projects that the students visited was the Bujjuko Low Cost Housing Demonstration, which is a component of the Decent Living project implemented by Shelter and Settlements Alternatives SSA. The beneficiaries include the Kwefako positive living women’s group, who were previously living in an informal settlement in Kampala city centre and ended up being displaced. The group were living under poor conditions and with the fear of eviction before they were identified as a potential partner. The group were encouraged to form a cooperative because it was the best way to have the community organised. SSA and WaterAid initiated to assist the group. Hence, the Kwefako Housing cooperative was conceived and registered in 2014. Participatory approaches have been heralded in the development discourse as crucial in achieving sustainable development (Parfitt, 2004, Cleaver, 1999). However, it has also come under criticisms and raised questions about its effectiveness in truly empowering those in the grassroots (Parfitt, 2004). The visit to the housing project offered an opportunity to understand how the beneficiaries influence the planning and implementation of development project from the start of the project to its completion. According to the SSA project assistant, participatory process was utilised in all phases of the housing project from the planning to the implementation stage. The project assistant stated that there were several consultations with the members of the cooperative on several issues ranging from what they wanted as a group to the location of the housing. On the question of location, a feasibility study was conducted with the input of the members of the cooperative. The members were then brought to the site of the proposed housing to see for themselves. The members agreed in relocating to the area because of its proximity and accessibility to markets, schools and places of worship. There are 34 members in the cooperative. 24 families are presently occupying the houses and 10 houses are going under construction for the remaining 10 members. The Cooperative members were also given the ‘liberty’ to draw their dream homes and after several consultations, came up with the current design. Not only did they come up with the design, they also constructed the houses themselves using the blocks that they made. Each Unit costs 26 million UGX to build. The residents pay an upfront of 10 million UGX and then 70,000 UGX monthly giving them about 30 years to complete the payment. However, they can pay up before the 30 years period. The amount they pay for these homes were said to be similar to the rent they paid in the informal settlement. On defaulting in payment, the group stated that if a month’s payment is defaulted, members could go to SSA and come up with a payment plan agreement. Although, the residents stated that paying is a challenge, they have several sources of livelihoods such as making and selling crafts. SSA was also said to have carried out some capacity building workshops with the cooperative members and trained them in different income generating activities. And according to the residents, future plans of generating income include acquiring machines to make and sell blocks and also, start giving training workshops. Apart from capacity building, SSA also engages in appropriate technology transfer with the group. For instance, the interlocking soil stabilizing blocks that were used to construct the houses were made from the soil in the land. Further, the materials they use in sifting the soil is mostly made from local materials. It was also mentioned that cultural and social issues were taken into consideration for this project. The use of interlocking soil stabilizing blocks was appropriate technology, which was suitable for the members. The site of the housing was suitable for the members and did not alter their social lives, rather enhanced it as they stated. Residents now enjoy amenities that they did not previously have. Each house has a water tank and each family pay what they use. There have also been other benefits from the project such as the national water extending water pipe to the community that the project is located in. 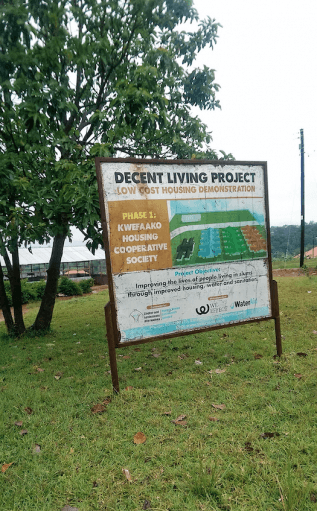 Demonstrating Decent Living – A Publication of Shelter and Settlements Alternatives and Uganda Human Settlements Network. The MSc Environment and Sustainable Development at the DPU is currently involved in a multi-year project of overseas field research in Lima, Peru. I was part of this project last year and worked in Cantagallo, a small area close to the centre of the city. My team’s initial plan was to explore the way the construction of a transport megaproject was affecting people working and living in Cantagallo. However, unexpected events occurred during our presence there, and they profoundly changed the situation. The megaproject was evolving more rapidly than expected and a relocation process of the population started in fundamentally different ways than officially announced. While several families had accepted this and begun to clear their plots in exchange for a controversially low amount of compensation, others were trying to resist and negotiate the terms of their relocation with the authorities. Many families were evicted without an acceptable agreement made, if any at all. However, as the video below attempts to illustrate, the situation differs from one case to another because Cantagallo has been inhabited by families with different histories, and thus, different rights according to the law. This diversity has added to the complexity of the situation: in some cases it has created conflicts within the communities and also hampered possibilities for negotiation with the authorities. On our first visit to Cantagallo, teenagers were playing football in a large circular area at the entrance to the neighbourhood. On our third visit, the landscape had literally changed within a few days: all trees were being uprooted and little temporary houses had started to mushroom in this same football pitch. We were witnessing the eviction of some and relocation of others. We knew we held no power to make a significant change. I remember the sense of panic that invaded our research group when we realised there was little chance we could realistically and positively contribute to the situation. But there was work to do and opportunities to explore. We decided to capture the complexities of Cantagallo, understand its intricacies and explore the injustices that have been produced and reproduced over time. Some people had already been evicted in the past and were about to experience the same again. We interviewed them to hear their stories. Despite the events, many people came to the workshop we organised there. More significantly, many people from different parts of Cantagallo came to our final presentation to hear what we had to say. It was really unexpected but they all came to listen, to comment and to discuss. Most importantly, they did it together. This big communication gap that we had observed and thought was hampering progress in negotiations was being bridged in front of us. This gave me hope that they could jointly engage with the authorities over the following weeks. Today (eight months later), I know the people of Cantagallo have not been able to resist the megaproject despite their collaborative efforts. However, I deeply hope that our work has provided them with some grounds to break the continuing cycle of eviction in Lima. Loan Diep is graduate from the MSc Environment and Sustainable Development at the DPU in 2014. Her academic background is in both natural and political sciences; she has degrees in Health, Safety and Environment (University of Caen, France) and a BSc in Environment Geography (UCL). Loan is currently working as a consultant for IIED (International Institute for Environment and Development) and as a research intern at WSUP (Water and Sanitation for the Urban Poor). She is also a Bartlett Ambassador for the period 2014-2017. Her interests lie in environmental politics, climate change, water & sanitation in the Global South. Read more about the MSc Environment and Sustainable Development overseas fieldtrips.